Okay, first I need to apologize for taking FOREVER to update this blog. We have been having major computer issues when it comes to uploading photos this summer and I just haven't had a chance to really sit down and figure out the problem until this weekend. I hope to do better. So this is the first of a few posts to update everyone on what we did all summer! We were fortunate enough to make it to the beach twice this summer. Our first trip was with Taylor, Allison and Miller Calhoun in mid-June. We went to Seagrove Beach and it was my first time to the Florida panhandle. It was beautiful and we had a fantastic time! We stayed at One Seagrove Place and really enjoyed being right on the water with gorgeous views and easy, quick access to the beach and pool. With two 1-year-olds we could not have chosen a more perfect location. Ainsley and Miller had lots of fun experiencing the beach and a big swimming pool for the first time. We found out that Ainsley is definitely a water baby. She LOVED the swimming pool and also loved going out into the Gulf of Mexico. Her first time in the pool she kept putting her face in the water and kicking like a little frog. It's amazing that she just instinctively seemed to know what to do. We need to get her in swimming lessons! She did not like the sand, though, and we were lucky to get a few pictures of her with her feet in the sand before she started screaming. 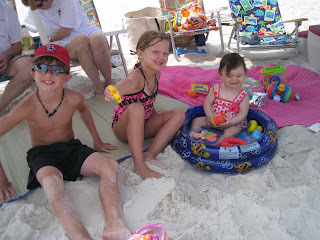 We quickly found out that the best way to keep kids this age happy on the beach is with food. We made sure to have plenty of snacks! Moss and Taylor were chefs for the week and made most of the meals. We ate a lot of delicious fresh seafood and even had a shrimp boil! Thanks guys! 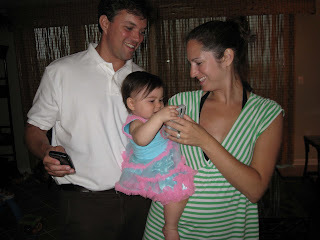 We went to Seaside for our one night out and ate at Bud and Ally's. I fell in love with Seaside! It is such a pretty town and is so family friendly! They have a large amphitheater surrounded by cute little shops and when we left the restaurant a great band was playing and the grass was filled with families. Ainsley loved listening to the music and watching all the kids dance and blow bubbles and run around. Our 7 days of vacation flew by with perfect weather (although it was record heat by the end of the week). We had a wonderful trip and can't wait to go back! 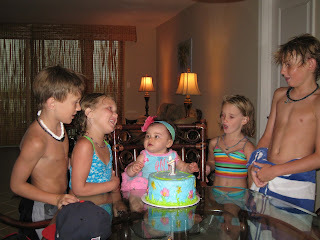 Our second trip to the beach was in July over Ainsley's birthday. Floyd and Lisa were so sweet to invite all of the Meltons to Lisa's grandfather's condo in Perdido. We had a wonderful long weekend with family and had a small birthday celebration with the family and good friends the Pedigo's. 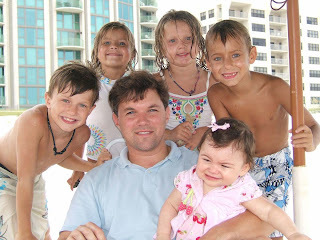 We also got to see Lisa's brother McLean and his family who live in Fairhope. We all enjoyed some beach time together and went to see The Hangover which was hysterical! 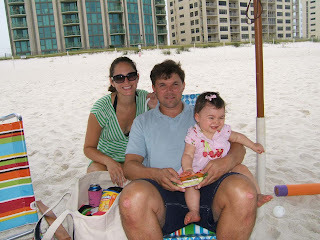 Unfortunately Ainsley started running a fever on our second day in Perdido so she didn't feel well most of the trip. We didn't get very many pictures because of that. 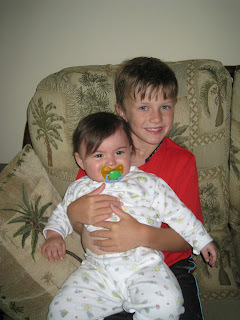 But we still got in lots of good family time, even with her feeling under the weather and refusing to eat normally. She loved being with her cousins Anne Craig and Floyd, as well her Moms and Granddaddy, Uncle Floyd, Aunt Lisa and Aunt Blewett. Thanks so much for a great family trip Floyd and Lisa! 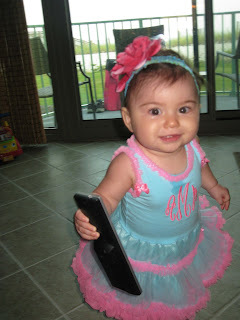 Ainsley on her real birthday, July 9th, in her birthday outfit. Floyd, Anne Craig, Elizabeth and Walker Pedigo singing Happy Birthday to Ainsley. 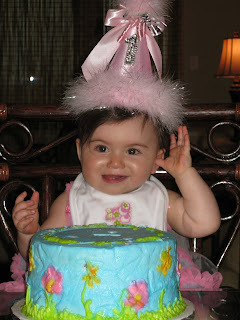 Ainsley in her birthday hat which did not last long before she took it off. Talking to Grandma and Grandpa in Ohio who called to wish Ainsley a Happy Birthday! Floyd and Anne Craig with Ainsley on the beach. Floyd with Ainsley at the condo.